Most of the engines used in German World War II aircraft were sound, reliable and capable of considerable further refinements. The main German aircraft engine manufacturers were key to the construction and development of the Luftwaffe. Argus Motoren (As), based in Berlin, produced “low power” engines for light aircraft and the pulse-jet engine used on the V1 flying bomb. Bayerische Motorenwerke (BMW), in Munich, was founded by Matthew Ruak; the company was renowned for its motorbikes and other vehicles, but also for its design and construction of aircraft engines, such as the BMW 801 piston and the jet engine BMW 003, as well as rocket-based weapons. The company has admitted to employing between 25,000 to 30,000 slave laborers during World War II; these were prisoners of war and inmates from concentration camps. Daimler-Benz (DB), in Stuttgart, was formed in 1926 by merging two companies which were pioneers in automobile manufacturing: the Carl Benz company (founded in 1883), and the Gottlieb Daimler company (created in 1890). After 1933, the Daimler-Benz company was closely associated with the Nazi regime. It expanded rapidly and made huge profits by producing not only tanks, cars and trucks, but also submarines and aircraft engines. Heinkel-Hirth (HeS), based in Benningen, was formed in 1941 by the nationalization of the Helmut Hirth Motoren Company which was merged with Heinkel Aircraft Company; the most prominent designer was Hans von Ohain who developed a series of piston and jet engines. Junkers Motoren ( Jumo) was formed in 1923 as a separate firm from Junkers Aircraft. Jumo had several factories all over Germany and produced piston engines (e.g., Jumo 210, 211 and 213) and jet engines (e.g., Jumo 004, the first jet engine to be considered production quality and used to power the Messerschmitt Me 262). There were several main classes of engine used by the Luftwaffe. The most conventional were the BMW 132 (derived from the American Pratt & Whitney Hornet) and Bramo Fafnir air-cooled radials. Another category included the V-type gasoline engines. The BMW VI had its output raised from 620/660 hp to 725/750 hp by increasing the compression ratio. In 1934, Daimler-Benz and Junkers had developed much more powerful inverted- V engines, such as the DB 600 and the Jumo 210, both giving over 700 hp—the former soon reaching 900 hp. By 1937, development was fast proceeding on two later inverted-V engines, the DB 601 and Jumo 211, both in the 1,000 hp class, with superchargers and ice-free, direct fuel injection. Both were destined to play an all-important role in the coming conflict. By 1942, German engines were marching forward almost too boldly and interminable problems were encountered. There were so many new designs and concepts that there had to be a ruthless pruning of more than forty engine projects. Work was concentrated on a few major types. The Daimler-Benz DB 601 had yielded to the faster Jumo 213. The excellent new BMW 801, the 14-cylinder air-cooled radial fitted to the Focke-Wulf Fw 190, had been put into production in various forms for several important bombers, such as the Dornier Do 217 and Junkers Ju 88. A piston engine, also known as reciprocating engine, is a device that utilizes one or more piston in order to convert pressure into a rotating movement. It works with pistons located inside a cylinder, into which a fuel (gasoline, a petroleum-based liquid) and air mixture is introduced by valves and then ignited by a spark plug. The hot gases expand, creating energy that pushes the piston away. The linear movement of the piston is converted to a circular movement via a connecting rod and a crankshaft. The burned gases leave the engine via valves and exhaust pipes. The more cylinders an engine has, the more power it develops, so it is common for such engines to be classified by the number and alignment of cylinders. Named by James Watt in 1782, the unit used for listing the rate of power application of an internal combustion engine is horse power (“hp,” for short). A fairing called a cowling usually encloses an engine. Part of the engine system, the fuel tank covers the functions of filling, storage, gauging, venting and feeding fuel to the engine through a pump. Placement of fuel tanks depended on the aircraft design; some were located in engine nacelles, others in wings or in the fuselage. For increased range, additional jettisonable fuel tanks could be carried externally under the wings or the fuselage. 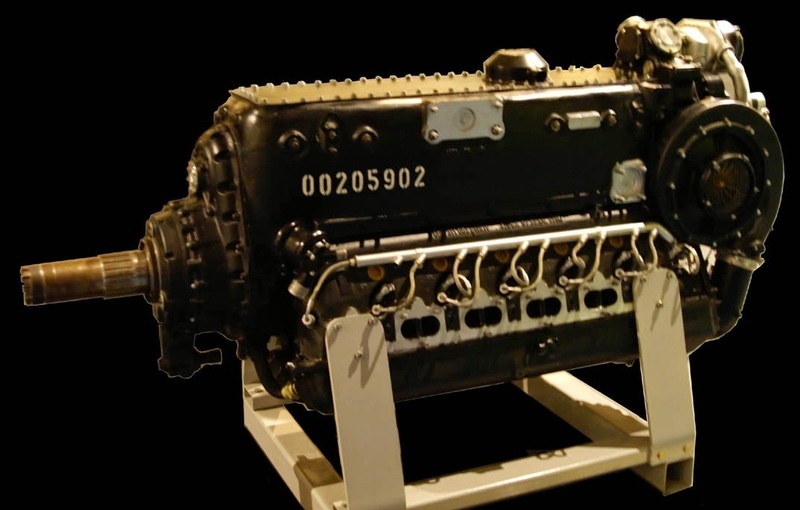 Before the introduction of jet engine there were basically two sorts of piston engines. The in-line engine, as the name suggests, is composed of cylinders placed in a row or bank. It comes in two basic arrangements. The straight in-line engine, in which all cylinders are aligned in a row one after another, is easy to build in a single metal casting; it provides smooth running, is comparatively narrow in volume but at the cost of great engine length. The V in-line engine consists of two banks of horizontally opposed cylinders attached to a single and common crankshaft. The cylinders are usually positioned at either 90 or 60 degree angles from each other; they thus appear to be like letter “V” when viewed along the line of the crankshaft. The V arrangement reduces overall length and weight; it also uses a short and strong crankshaft, and thus tolerates high rotational speeds and high torsional stresses. Both straight and V in-line engines generally require a cooling fluid to remove heat or complicated baffles to route cooling air, as the rear-most cylinders receive little airflow. Liquid-cooled engines were complicated, costly and vulnerable in battle. A radial engine is a configuration of internal combustion engine, in which the cylinders are mounted equidistant around the circumference of a circular crankcase, in other words arranged pointing out from a central crankshaft like the spokes on a wheel. Cylinders and crankcase are fixed and the crankshaft rotates; but in the case of a radial rotary engine, the crankshaft is fixed and cylinders and crankcase rotate around it. For aircraft use, the radial engine has several advantages over the in-line engine. With all of the cylinders at the front, it is easy to cool them with natural airflow, and air-cooling saves a considerable amount of complexity and also reduces weight. A radial engine is also far more resistant to damage, an important asset for military aircrafts. If the block cracks on an in-line engine that entire cylinder bank loses power, but the same situation on a radial often only makes that individual cylinder stop working. The radial design also has disadvantages. One is that a supply of compressed air and feeding fuel has to be piped around the entire engine, whereas in the in-line only one or two pipes are needed, each feeding an entire cylinder bank. Another disadvantage is that the frontal area of a radial is always large, with poor aerodynamics and thus greater drag. The debate about the merits of the in-line versus the radial engine continued throughout the 1930s and during World War II, with both types widely used. Invented by Rudolf Diesel in 1892, this type of internal combustion engine is a compression ignition engine in which the fuel is ignited by high temperature created by compression of the air/fuel mixture, rather than by a separate spark plug. The heavy-oil diesel engine has several advantages: good reliability (namely less risk of catching fire), high durability and low fuel consumption. Diesel fuel is cheaper than gasoline, it is a form of light oil, but the engine can usually operate a variety of different heavy fuels, including crude oil. The main disadvantage is the very sturdy construction needed; the diesel engine is generally heavy and bulky and this generates a severe penalty on an aircraft’s weight and speed. For this reason diesel engines played only a small role and were not widely used by German designers before and during World War II. They were mainly mounted to power huge airships like the Zeppelin series, or large flying boats such as the Bv 138, Ha 139 and Bv 222 built by Blohm & Voss, as well as Do 18 and Do 26 produced by Dornier, in which the demand for sturdiness and reliability was more important than weight and speed.